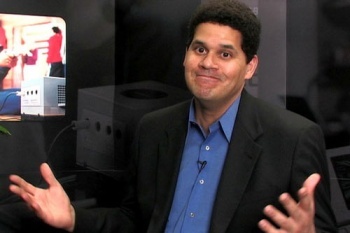 Sony and Microsoft have to match the Wii U's appeal, according to Nintendo. After moving 400,000 units in one week, Reggie Fils-Aime, president of Nintendo of America, is pretty optimistic about the Wii U's long-term prospects. Fils-Aime is so confident, in fact, that he's issued a challenge to competitors Sony and Microsoft: this time, you'll respond to us. While the original Wii was the last one released in the console wars of the last generation, the Wii U has spearheaded console gaming's next generation, and Fils-Aime stands behind its early launch. Fils-Aime has some harsh words for Sony and Microsoft regarding their next consoles, which will likely be more traditional than Nintendo's Wii U. "In the end, our competitors need to react to what we're doing in the marketplace and need to figure out what their innovation will be," says Fils-Aime. "It's likely that faster processors and pretty pictures won't be enough to motivate consumers." The Nintendo president believes that one of the Wii U's primary selling points is its unique control scheme, and that Sony and Microsoft will have to offer something of similar distinctiveness to deliver a worthy next-gen experience. While the Wii U has launched far ahead of the purported Xbox 720 and PlayStation 4, Fils-Aime does not believe that the difference in release windows will hamper Nintendo's system. "For us, launching new systems is about bringing new consumer experiences to the marketplace and we're doing that," he explains, and believes that all the technology is already in place for a new system launch. "[Now] is the right time to launch new hardware." The Wii U more or less has a monopoly on next-gen consoles for the time being, but Microsoft and Sony are sure to respond in kind, and perhaps with more ambitious plans than just increased specs for their consoles. Now is as good a time as any for Nintendo to play offense, but with the forthcoming introduction of two new consoles, the landscape could change very rapidly.